ETFGI reported today that ETFs and ETPs listed in Europe gathered US$2.15 Bn in net inflows during April 2018, less than half of the net new assets gathered during the same month in 2017….. According to ETFGI’s April 2018 European ETF and ETP industry insights report assets invested in ETFs/ETPs listed in Europe increased by $4.45 Bn during April 2018. At the end of April 2018, the European ETF industry had 1,655 ETFs, with 6,355 listings, assets of $788.51 Bn, from 56 providers on 26 exchanges in 22 countries. At the end of April 2018, the European ETF/ETP industry had 2,303 ETFs/ETPs, with 7,613 listings, assets of $830.21 Bn, from 66 providers on 27 exchanges in 22 countries. April 2018 marked the 43rd consecutive month of net inflows into ETFs/ETPs listed in Europe. The $2.15 Bn gathered during the month was 58.88% less than the $5.23 Bn in net inflows during this month last year. 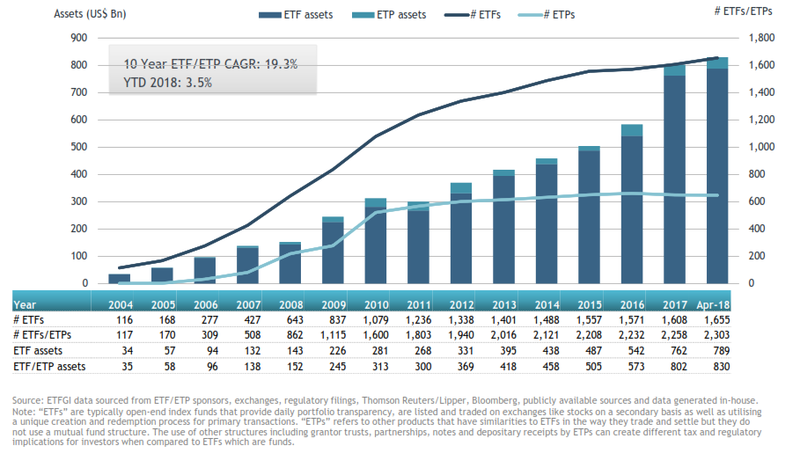 The majority of net new inflows can be attributed to the top 20 ETFs by net new assets, which collectively gathered $15.47 Bn during 2018. The iShares Core MSCI EM IMI UCITS ETF (EMIM LN) on its own accounted for net inflows of $1.78 Bn.